These days there is lots of conflicting information coming out about “psychiatric illnesses”. On the one hand, you (or someone you care about or provide services for) , may have been told that you have a psychiatric diagnosis like schizophrenia or bipolar disorder; that you will have this issue for the rest of your life, and that you will need to take medications for the rest of your life. On the other hand, you may be hearing that respected and rigorous research is showing that mental health challenges are “episodic”, which means that they go away over time. You may also have heard that psychiatric medications can cause long term health problems like diabetes, obesity, and sexual dysfunction. These problems do not necessarily resolve when you stop taking the medications, and that after you stop the medications, your mental health issues may be more extreme than before you started. What do you do with information like that? First, refer back to the Key Concepts of mental health recovery that I gleaned from my early studies — hope, personal responsibility, education, self – advocacy and support–in this case, specifically personal responsibility, education, and self advocacy. There is an intensive review of these Key Concepts in WRAP Plus, [Copeland, Mary Ellen. (2010) West Dummerston: Peach Press]. In the past you may have felt that others would “take care of you” and make decisions for you regarding your treatment and your life. Now you are going to have to take back Personal Responsibility for yourself. You are the expert on yourself and you are going to have to make decisions about your treatment and your life. To do that, you are going to have to Educate yourself. That means you are going to have to study these topics. The internet is an excellent resource. I suggest you read Anatomy of an Epidemic (Whitaker, R. (2010) New York: Random House]. Whether you agree with the findings or not, you need to know them. Then do an internet search of the medications you are taking and any other topics of concern to you. If you can’t do all this research yourself, ask a trusted supporter to work with you on it. Then, based on what you have learned, decide what action you are going to take in your own behalf. And then you are going to need to take that action. That may take some Self Advocacy. Make sure you have plenty of Support as you make any changes you decide on. Next, develop for yourself (if you haven’t already) a Wellness Recovery Action Plan that includes a strong Wellness Toolbox and then “live it”. Use it as your guide to daily living every day, every hour and every minute. This may sound extreme. But so many, many people have found that this is the best way to work their way out of the mental health difficulties they are experiencing and into a rich and rewarding life. If you need to be connected to a WRAP group, contact the peer run mental health agencies or organizations in your area. If you need help with that, contact the Copeland Center. You can use one or several of the many WRAP resources as your guide to developing your WRAP. 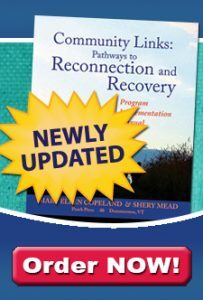 You can find them on-line at www.mentalhealthrecovery.com . You can also use the Build Your Own WRAP course or any of the other e-learning courses at https://mentalhealthrecovery.com/wrap-courses/. It is my hope that we are all moving toward a time when anyone who reaches out for help for mental health challenges is encouraged and supported in using simple, safe, and free Wellness Tools to help themselves feel better, instead of being diagnosed, given dire predictions of their future, and told they will have to take medications for the rest of their lives.